It might not be fully warm yet, but summer is finally coming! As the weather warms up, we always notice the clothing sections in stores changing over from coats and sweaters to shorts and bathing suits and it makes us a little bit excited. Of course, there’s a stereotype out there that trying bathing suits on is an unenjoyable process, but we never said we were excited because we’re going to buy a new bathing suit. 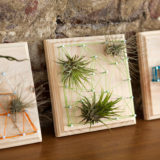 We’re DIY enthusiasts; we’re going to make our own! 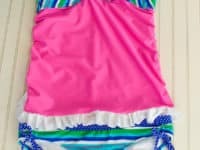 Check out these 15 adorable bathing suit alterations that will help you either make or customize a new suit in whatever style, colour, or fit you like and feel comfortable wearing. Three cheers for DIY helping everyone feel confident this summer! Do you always find that the hardest part of choosing a store bought bathing suit is getting the top right because most bathing suits don’t provide a lot of chest support? 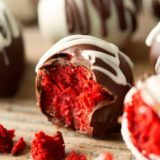 Then you’re going to love this idea from Tasha Delrae! 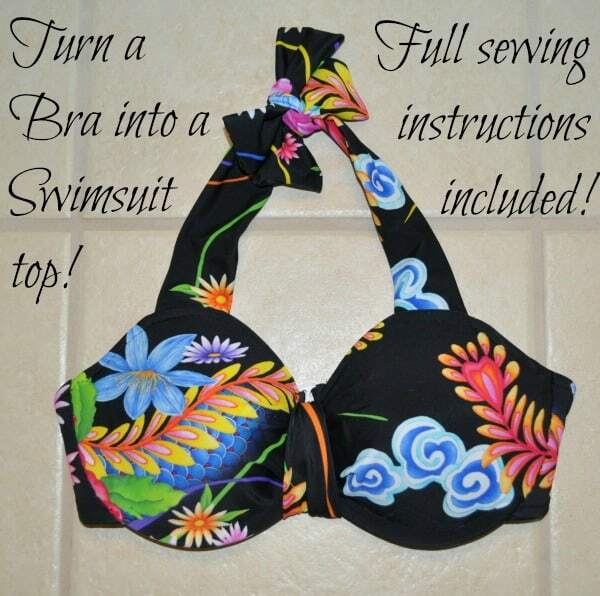 Their tutorial shows you how to turn an old bra that you already love the fit of into a bathing suit top using material that you enjoy to customize the style. They also teach you how to add a halter style tie to make sure the top stays in place well. You’ll have far less to worry about on the beach if you know everything already fits you the way it should! Have you seen the monokini trend in stores and bene intrigued by it but you just can’t justify spending more on something that’s very popular when it’s made of even less material than the one-piece bathing suits you already own at home? Well, it’s a good thing you’re a DIY enthusiast then! 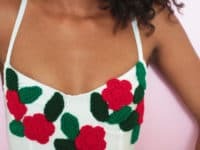 Plan B guides you through the process of turning a bathing suit you already have into something that looks like you just picked it up from a fashion outlet thanks to neatly cut and seamed side cut outs. You’ll still get a lot of sun and be beach ready without looking like you’re ready to swim at the Olympics, but it’ll stay on better when you take a dip, unlike some classic triangle bikinis. Do you have a rather plain bathing suit that you already love the fit of, but you’re bored with the way it looks or you’d like to jazz it up since last year because you already wore it for a whole season? 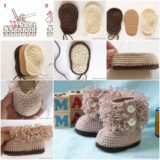 Then check out how The Kipi Blog used their crochet skills for some bathing suit embellishment! 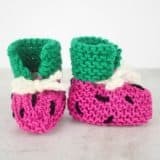 We love any DIY project that lets you combine crafting skills the way this one blends crochet, sewing, and fashion alteration. Just make sure you use acrylic yarn so that the flowers can withstand getting wet without being ruined. Are you intent on remaking one of your bathing suits to give yourself a whole new style but you just can’t decide on what style you want to do? 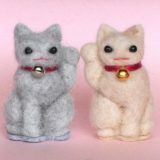 Well, you could search a whole bunch of different tutorials, try the one that alters the suit the least, and consider redoing it again later… or you could check out this tutorial from Cotton and Curls that shows you how to make three different styles in one place so you can consider your options a lot more easily! Do you have a bikini left over from last year that you quite like the fit of but you think it’s a little too plain? Maybe you’d just rather switch things up since you wore that bathing suit all last season, but you’d not ready to spend the money on a new suit. Instead, grab some lace from your stash and add a pretty trim along the bust and the bottoms! We love the idea of choosing a different colour than the suit to give the whole look a little bit of contrast. 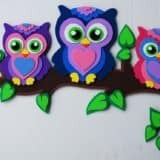 Crafty Moods shows you how to do it. Perhaps you really like the idea of altering a suit you already have but you’d rather have the look be a little more subtle than some of the things you’ve seen so far, even if a bit of colour contrast is a good thing? Then check out how Travelettes made it happen by adding some simple elastic straps! This is also a good way to adjust the fit of a bathing suit that you like the look of but that has always been just a little bit too loose or too tight. Are you still intrigued by the idea of transforming one of your one-piece bathing suits but you’re not sure the side cut outs are quite the style for you? Then check out this super stylish chain braid suit with A-line straps! 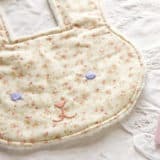 Plan B teaches you how to do the simple sewing alterations and also build the braided pattern with a very simple looping technique that you’ll be able to use in all kinds of clothing alteration projects once you’ve mastered it. Have you had your eye on a vintage 1950s style bathing suit with high waisted bottoms but you’re just not quite ready to spend the money when you already have so many suits in other styles at home? Well, instead of buying something new, try altering a few of the things you already own to create the style you want! We love the way Lady Maple created a pair of stylishly high wasted bathing suit bottoms using the bottom half of a one-piece bathing suit. Match it with a bikini top that you love and already own, and voila! Do you have an old bikini that you used to enjoy wearing but now you either don’t enjoy the fit or have become tired with the style? Maybe you still like the colour or the pattern but would prefer a bit more coverage this year. Then you should definitely check out how Over the Big Moon used pretty contrasting fabric to create a tankini top from a bikini top. Most styles of bikini have some type of strap that goes up over the shoulders or around the neck. Some people like this because it gives support, but other people either don’t like how it feels and find it constricting or don’t like that those types of straps give them tan lines. Strapless bikini tops are always an option, but what if you still want to make sure the top stays on very well? 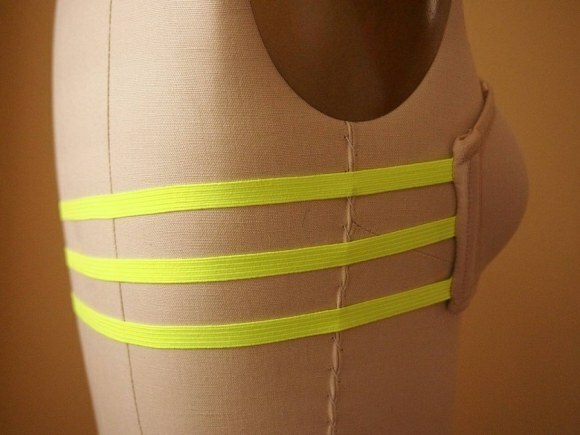 Then check out how What I Do altered their top to have three elastic straps around the back in a stylish way instead! 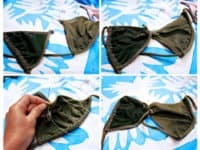 This tutorial was originally intended to turn a bra into a bandeau, but the technique will work for a bikini too. 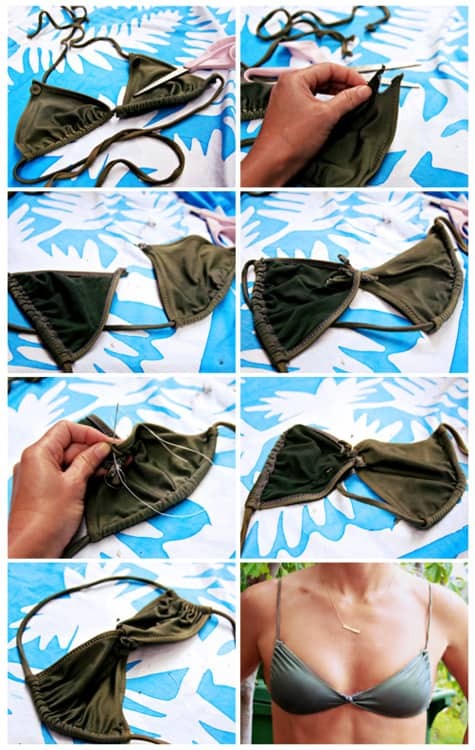 Did you know that altering an old bikini top to make it a different style and fit you better can be as simple as just angling the top differently and tying it in an alternative way? Well, just in case, here’s a tutorial from Goldfish Kiss to show you how! 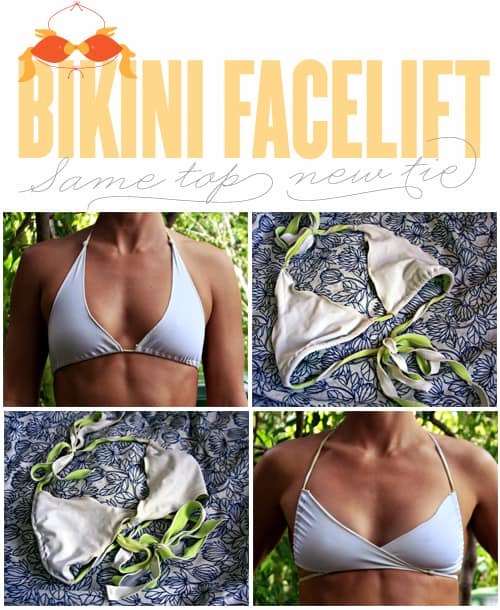 This tying method turns a simple bikini top into a wrap style suit instead, which looks cute and will help it stay on better. Do you have a pair of bikini bottoms that you love the colour and style of but that have never really fit you properly at the back? Well, instead of getting rid of them, why not make a surprisingly simple alteration that will pull the material in and up for a better fit? 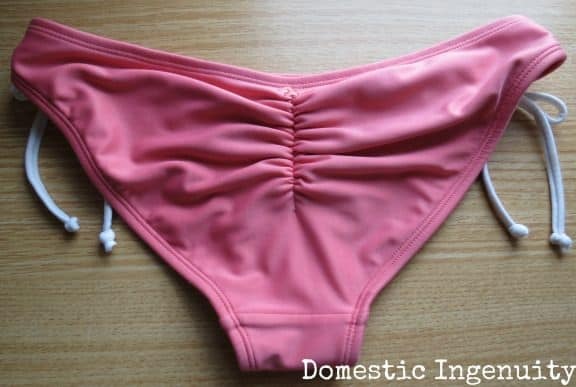 C8t3 guides you through the process of adding a pucker to the centre back of your bikini bottoms so they actually sit on your bum properly without sagging or shifting around. Perhaps you have a one piece that you love the fit of but that you find too plain, but you’re not keen on the idea of cutting pieces of it in case if affects the fit? Then get your fabric dyes out instead! Jennuine teaches you how to dip dye your suit in a way that lets you create a pretty ombre effect in whatever colours you choose. Are you a big fan of smaller bikini tops because you find that they fit you better, but you’re very active in the summer so you’re still worried about them shifting around? Then we think you might enjoy this simple alteration from Goldfish Kiss! 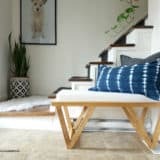 When you read the term “alteration”, did your mind automatically picture a project that involved a little bit more DIY in a more challenging way? Perhaps you’re set on choosing a bikini project that involves a bigger garment transformation than what you’ve seen so far. In that case, this vintage t-shirt upcycling project might be a little bit more your style! Tree Hugger guides you step by step through the process of cutting and sewing an old band t-shirt into a classic triangle tie bikini so you can rep your favourite music on the beach all summer long. The material won’t be water proof like a store bought bathing suit but let’s be honest, not everyone goes to the beach to swim! 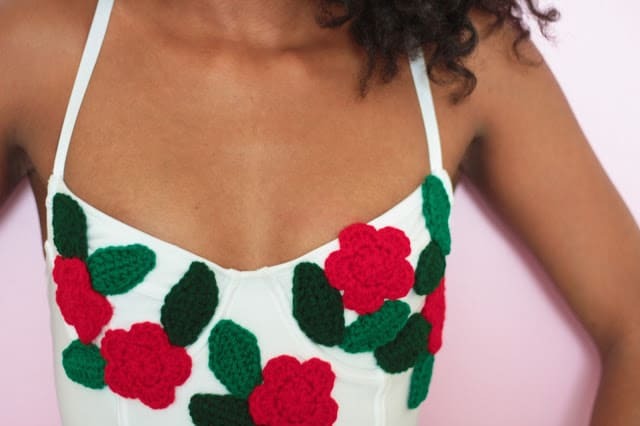 Do you have another crafty friend who’s been wanting a new bathing suit but would rather upcycle something they already have than buy something new? Share this post with them for a little bit of inspiration!